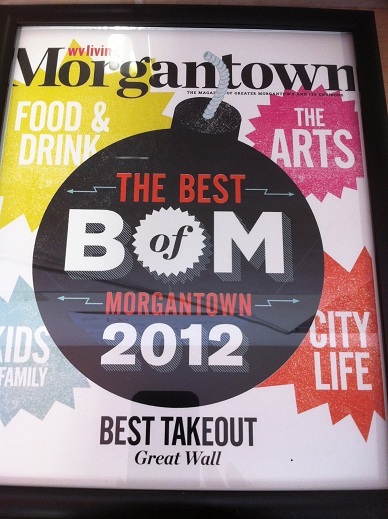 We've been named the best takeout in Morgantown! We're open on Christmas and New Years! Want to see what you're ordering? Check out our new photo book for pictures of almost every entree available! When you place an ONLINE ORDER, be sure to check your e-mail for an order confirmation! Special Requests written on your orders may result in additional pricing than what the online system tells you. You can always call the restaurant (304-291-3412/3417) regarding special requests. Please double-check your order. If your special requests or order has an error, please call the restaurant to correct it. If you order an item and received something different from what you've purchased, you must call in within an hour of receiving your order to get your money back or a replacement order. if you do not call within one hour, we are not liable to replace it. Thank you.